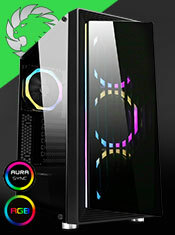 If you are looking for a value case but want a gaming futuristic look, Cruise Star Advance is the case for you! 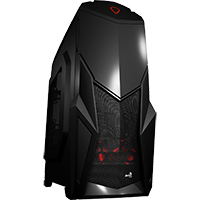 With a decent price tag, this case can install up to two 2.5" HDD/SSD or three 3.5" HDD and a clearance of up up 350mm or 375mm without front fan for installing high - end long graphic cards without any problem. A red LED 12cm fan is included in the front and top panel which adds a cool look when powered and it also gives the airflow the case needs. Whats more is the case is equipped with SD/TF card reader, what a bargain! Front Panel - All black chassis interior. 5.25"bay - you can install an ODD or fan controller panel. 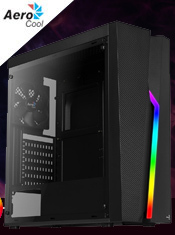 Unbeatable Airflow - Large front mesh design allows big volume of air to be drawn into the case for fast cooling. HDD Allocations - Supports up to 3 x 3.5"HDD and 2 x 2.5" HDD/SSD. Cooling - The Cruise Star Advance includes 2 Quad Red LED's, one at the back and one at the top to add some colour to your chassis.